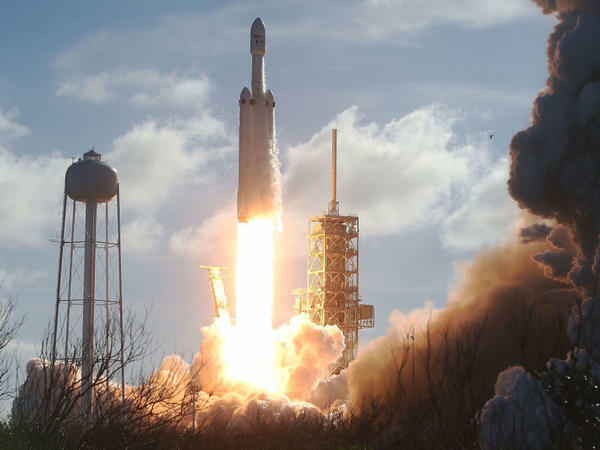 The SpaceX Falcon Heavy rocket lifts off from launch pad 39A at Kennedy Space Center on Tuesday in Cape Canaveral, Fla.
On Tuesday, Elon Musk's SpaceX successfully launched its most ambitious rocket to date, the Falcon Heavy. This is a transformative spacecraft, a behemoth that essentially straps three Falcon 9 rocket cores together. At 224-feet tall, it's smaller than NASA's giant Saturn V (363 feet) — but it is the largest privately built spacecraft to date. The Falcon Heavy is capable of lifting 70 tons of payload to low-Earth orbit and almost 30 tons to a geostationary transfer orbit. It is a test flight on Musk's more ambitious road to start colonizing Mars in the next half-century by establishing a city with 1 million people on the Red Planet. The successful launch hailed a new era for space exploration. Apart from overcoming all the technical difficulties, the more amazing (and media savvy) feat of this test flight was to put the first man-made object — which has nothing to do with space — into solar orbit: Humanity's first solar-orbiting car. Musk decided to put a red Tesla Roadster in a 1 billion-year elliptic Mars orbit. The privatization of the space race is increasingly accelerating its pace. Jeff Bezos, founder of Amazon, runs the spaceflight company Blue Origin, which is developing its own heavy lifter, New Glenn. NASA, of course, is not yet giving up; it is working on a huge rocket called Space Launch System. It's a sustainable and affordable system dedicated to deep space exploration, including crewed flights to Mars. Both rockets are supposed to be operational in the 2020s. There is a clear tidal shift going on. If the legacy of the current generation of space exploration has been to map and visit most of the worlds of our solar system with robotic missions, the next is looking at sending people out there, especially to Mars. As with our ancestors who pushed out of the African savanna to explore the world, where we will go seems to be limited only by our imagination. And money, of course. Every mission needs sponsors. We've seen this movie before. Similar to what happened with European nations in the 15th and 16th centuries, competing to build faster and stronger ships to explore (and exploit) the "New World" and bring back riches, the focus is now aimed at outer space. The world changed irreversibly because of the New World explorers; America, as we know it today, being a byproduct of their quest. It is fitting that initiatives to continue this outward-bound quest are, for now, coming mostly from the U.S., a country with a history written by the good and bad deeds of its explorers.